It was first performed on April 1, 1940 at the Richmond Theatre in London before moving to the Vaudeville Theatre where it opened on May 1, 1940. Despite some positive reviews, the play closed on May 18 after just twenty-three performances. The part of Hercule Poirot was played by Francis L. Sullivan who had previously played the role in Christie's 1930 play Black Coffee. Ridley changed the name of two of the characters from the novel. Freddie Rice was renamed Frances Rice and Jim Lazarus (who in the novel was Jewish and was the subject of some Semitic references) became Terry Ord. Freddie's drug-addicted husband was billed as "A Stranger". The action of the play takes place at St. Loo in Cornwall during the course of five days. Scene 2 - Hall at End House. The same evening. Scene 1 - The same. Two nights later. Scene 2 - The same. Early next morning. Scene 3 - The same. The next day. The same. The next afternoon. 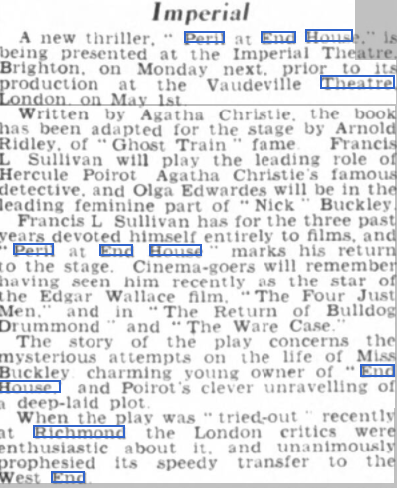 The Times reviewed the play twice, firstly in its edition of April 3, 1940 when they commented on Sullivan's portrayal of Poirot stating that he "preserves the essentials of the man, and there is never any doubt that he is indeed the greatest detective in the world". They further commented that the nature of Christie's books meant that they "do not struggle and protest against the limitations of the stage as so many detective stories seem to do when they are adapted". The role of the 'stranger' in the play was felt to belong "to a cruder tradition" however "for the most part, the play is less a 'thriller' than a satisfactory exercise for those little grey cells M. Poirot possesses in such abundance". The second reviewer, in the edition of May 2, 1940, felt that Poirot was too talkative and that "there are times when we should prefer that the syllogisms were acted rather than spoken, but talk is on the whole agreeably lucid and vivid, and though the solution, when it comes with a sudden rush of action, seems larger and more complicated than the mystery, it cannot be said that the tale anywhere conspicuously hangs fire". Ivor Brown reviewed the play in The Observer's issue of May 5, 1940 when he said, "Miss Christie knows how to complicate a crime. Mr. Ridley sustains the mystery. The Cornish seas are packed with red herrings, and solvers will also have to keep an eye on some strange old trout. There let the matter rest. The form of entertainment is familiar. It took my mind back to the days of The Bat. In these affairs time does not march on, but M. Poirot agreeably passes by." Bernard Buckham in the Daily Mirror of May 3, 1940 said the production, "has its exciting moments, but more action and less talk would have made it a better play”. From the Aberdeen Journal of 2 April, 1940. Francis L. Sullivan as Hercule Poirot, Agatha Christie's celebrated Belgian detective, gives an outstanding performance in Arnold Ridley's dramatisation of Miss Christie's "Peril at End House," which had its premiere at the Richmond Theatre last night. Sullivan will be remembered by audiences as playing Poirot on tour in "Alibi" some ten years ago. The plot, a slick one and Mr Sullivan has the assistance of a fine cast, in which Diana Beaumont, Olga Edwardes. and lan Fleming as a sort of "Dr Watson" to Poirot's "Holmes," shine. From the Daily Mirror of 3 May, 1940.
l often think detective plays would be jolly good if only the detective did not keep butting in. The stage sleuth is for ever explaining how clever he is, and revealing his mental processes. In order to do this he has to have a "stooge" or dumb companion who listens to all he says —because nobody else is likely to —and asks idiotic leading questions. How refreshing if, for once, the detective made a mistake and let the criminal get away with it ! What joy if Dr. Watson occasionally turned the tables on Sherlock Holmes and showed him up to be a perfect fool ! To what raptures of unexpected enjoyment would it not transport us if we saw a whole detective play in which the detective did not appear at all: I say this because whenever I see a detective play, as I did this week (“Peril at End House,” Vaudeville), I feel that the events which are supposed to take place on the stage are much more exciting than those which take place on it. The assaults and batteries, the halr- breadth escapes, the kidnappings, the blackmailings. the shootings and shoutings, the general hue and cry. These are the stuff of which crime drama is made. Instead of which, nine times out of ten, we are merely told about them while the detective expatiates his marvellous powers of deduction, which may amount to second sight, but are a darned sight too clever by half. In any case, we know from the start that the detective is going be right. "Peril at End House" introduces Agatha Christie’s Belgian detective Hercule Poirot and his stooge, Captain Hastings. Poirot is quite an amusing cuss, because imperturbable vanity steps in at appropriate moments to save him from becoming a bore. In this play he has a satisfying representative in Francis L. Sullivan, who is a big actor in more senses than one. The last part weighed by Mr. Sullivan in the West End was that of General Goering ! "Peril at End House" has its exciting moments, but more action and less talk would have made it a better play. The house, by the way, is in Cornwall, so, of course, it Is on a cliff, has an evil, eerie atmosphere, and a sinister, rude -to - everybody housekeeper: one of those women who deserves, but never gets, a good kick in the scantles —or whatever equivalent garment sinister housekeepers wear. From the Hull Daily Mail of 3 May, 1940. HERCULE POIROT is as talkative as ever in Arnold Ridley's adaptation of an Agatha Christie's thriller at the Vaudeville Theatre. Few of the large number of suspects have a chance of making themselves heard when Mr Francis Sullivan is busy solving the mystery of "Peril at End House." Mr Sullivan is wonderfully energetic as the very important Belgian detective, and Mr lan Fleming as "dumb as can be" as Captain Hastings. Miss Olga Edwardes presents a lively Nick Buckley who has a large share in the plot. From The Sussex Agricultural Express - Friday 19 April 1940. From the Stage of 25 April, 1940. Agatha Christie, author of "Peril at End House". .... and at the Vaudeville Theatre, London, from 1 - 18 May, 1940. Arnold Ridley, who adapted "Peril at End House" for the stage, later become famous for his portrayal of Private Godfrey, in the long running BBC comedy, "Dad's Army".